The “contemporary agora“ acts as a magical gathering point for people from all over the world. 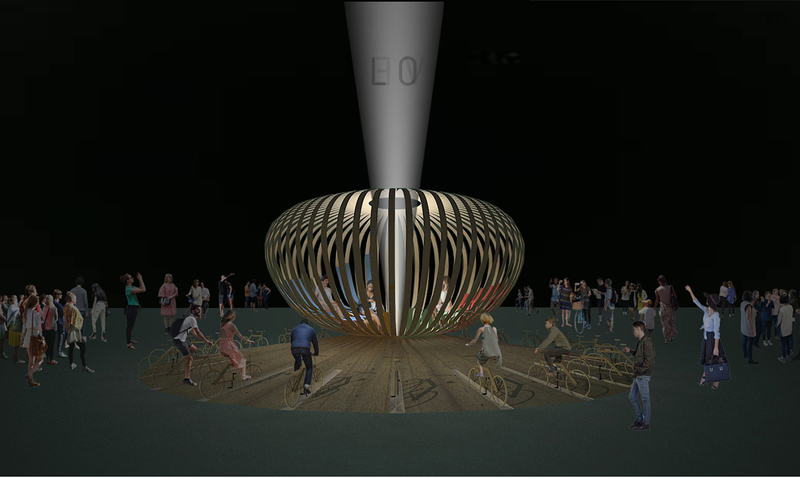 The “Zoetrope” represents more than a mobile sculpture or ephemeral installation: it is a magical new experience, a unique gathering point for people from all over the world. As an extension of the Helenic Parliament building in Athens, the space will be open to all citizens: a space created for people, an inspiring environment for social conversations harking back to the democratic polis of ancient Greece. The installation’s design is inspired by traditional Greek handcraft lamps and baskets. 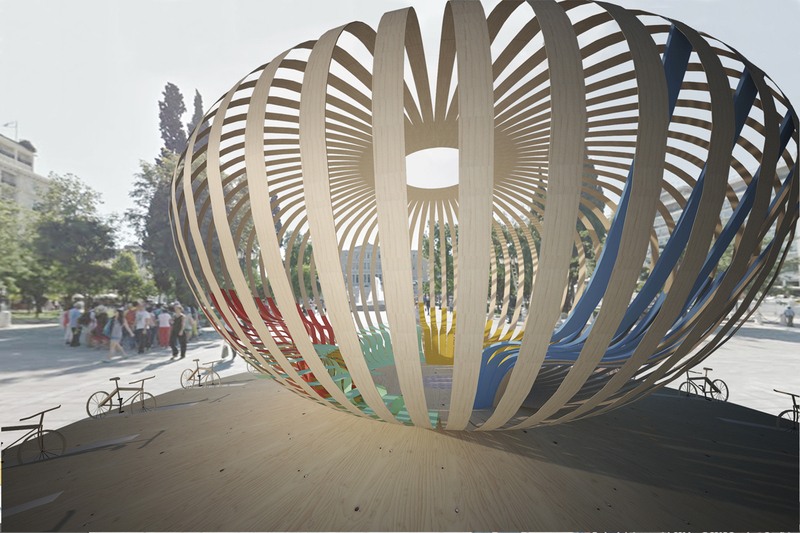 The structure will be completely wooden, formed by sixty radial lamellas 200 mm wide and 9,5 m long. Twenty-eight bikes, representing the twenty-eight nations of the EU (European Union), will also surround the central object and will interact with it, creating electricity to illuminate the object at night. 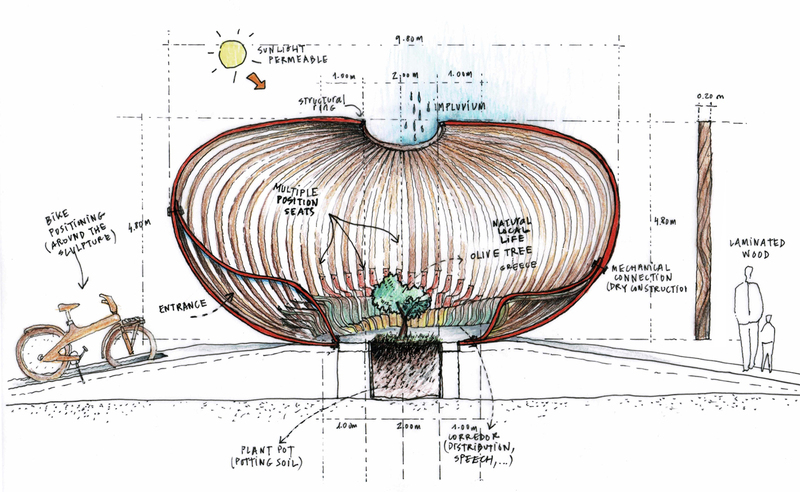 Depending on the amount of kilometres completed by citizens per day, the object has the potential to become illuminated in a variety of different forms throughout the course of an evening. More kilometres cycled thus results in a more spectacular lighting performance. 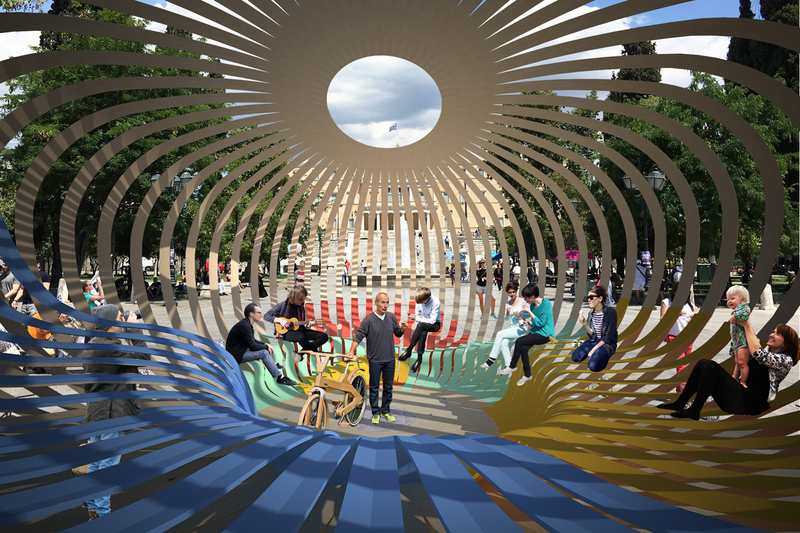 The aim of the Zoetrope is to invite Greek citizens to use the bike in order to avoid traffic jams in cities, thereby promoting a healthy society through physical activity, and the resulting happiness produced by riding a bike. Furthermore, this project will enable social interaction, facilitating an engaging platform with which to start a conversation with a stranger. 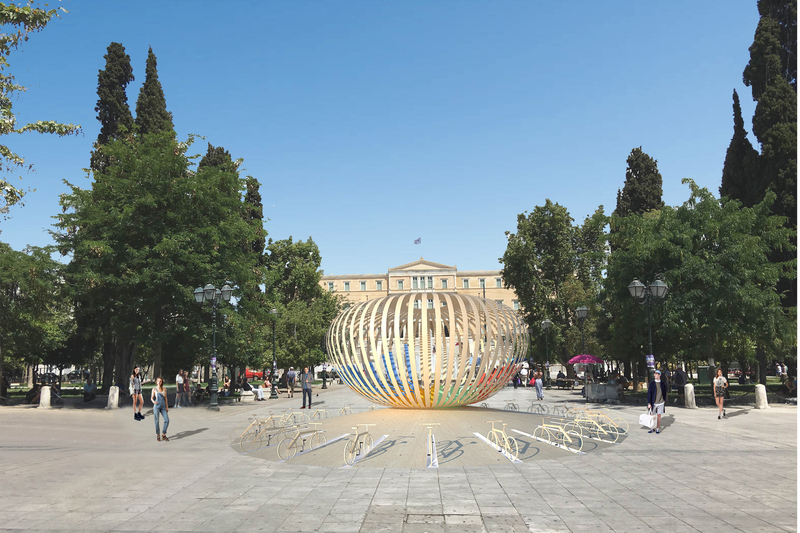 This transportable landmark will begin its journey in Syntagma Square in Athens, before completing a journey across the most important Greek cities. This project thus aims to transmits the beauty of Mediterranean / Greek values on a global platform. A contemporary agora, the space will also host many different activities, ranging from inspiring talks, concerts, debates, and theatre. With the support of the Greek people, when the twenty eight bikes are moving at a great speed, the Zoetrope will ‘take off’, landing in Berlin in front of the Reichstag: a sign of friendship between Greece and its fellow European neighbours. It is a symbol of peace, love, and empathy. Despite the recent challenges that Greece has faced, this work seeks to honour the Greek nation, as well as the pride of its citizens. This installation / work of art will be realised in collaboration with our sponsors, including Coco-Mat, the internationally recognised Greek company.